This wonderful FAQ/Guide was created by ookiii. If you have any questions/concerns/comments/complaints, the best way to contact her is through discord, and you can also find her on MantasticPAD’s discord or the Creature Quest discord, where she is ookiii#1206. You can also reach her by email at ookiiicq@gmail.com. There are 4 different aspects of this game, Quest, Kingdom, Challenge, Battle Tower. Quest and Battle Tower are PvE game modes, Challenge is PvP, and Kingdom is used to (eventually) help make your creatures more powerful with shrines to boost stats. Mantastic’s Beginner Guide has a ton of information about these different game modes and the different currencies that is always worth reading, despite not having anything about kingdom. 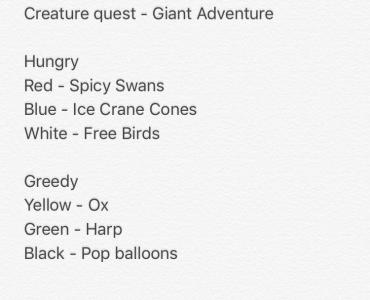 This means that if you want white EXP, you would first choose “hungry” when given a choice between “hungry” and “greedy”, then pick “free birds” from the three choices you get next. Giant Adventurer is the easiest map to farm one color of EXP, and the best location is the color Grand Wish Quests, which rotate Blue → Red → Green → Yellow → White → Black, and then 4 hours of each Grand Wish starting Sunday midnight GMT. Where do I get XYZ evo material? Fragments, sigils, runestones, and eternal runestones can be found in the appropriate bicolor quests – blue and white, red and green, or yellow and black. Just look through the start screen to see which difficulty you need to play to acquire each. The above can also be acquired, and in greater quantity, from that color’s Grand Wish quest, but are available less often than the bicolor quests. How do I build good teams? Here I have 2 stuns – Fire and Cloud Giant, a silence – Sphinx, a heal – Astral, and a nuke – Minotaur. Here, Minotaur can have special up turn 2 and 8x multiplier on a damage row. The best way to learn good team building though is to just try things out, talk to more experienced players about what teams run and why, and figure out what works for you and your box! No. Never take these “bundles” they offer after evolving/summoning. And while we’re on this topic, never summon with diamonds unless you have 800 to do a multi summon. You’re only guaranteed a epic/legendary when you do a multi summon, otherwise you’ve probably just wasted a few hundred diamonds on 1 dot rare creatures. Diamond/color idols are fine to pull whenever you get them. Some people like to save their idols for events for better luck; you can be one of them if you choose. Just make sure you save enough idols to pull once a day for your daily missions. There’s these quests labelled “Event”, are these worth farming? These are the rotating epic quests. White Elemental, Treant, and Siren are the epics you should definitely farm at least a 3-dot, if not 4-dot, and fully awaken (15 more copies of the card). White elemental is farmable AoE damage that is usually used to quickly swipe through floors, as even 8x is enough to nuke through most easy content. Treant is a farmable silence and is useful for BT 49-51. Siren is the best farmable healer that is currently available to new players. Also useful for BT 49-51. Elephant is a little bit more niche, but buffs can be helpful at times. Regardless, you should get at least one max awoken of each epic, as it will be useful in kingdom. If the event map is not one of these, it’s a special event quest map. These epics range from really good – like dark elf, hunchback, and draconic gallant (when it was dungeon challenge meta), to mediocre. It is not guaranteed that these creatures will be farmable again, so you should generally shoot for at least 1 max awoken 4-dot, if not more (as in the case of dark elf). I’m stuck on BT 37, what am I doing wrong? Your creatures are probably not leveled enough, or you’re not bringing enough utility right now to let your creatures kill the vampire fast enough. It’s hard to say exactly what your team should be without looking at your box, but in general, stun and silence are key to giving you enough turns to chip down the vampire. How do I clear BT 51? There’s a lot of ways to do it! Players were clearing it before shrines and kingdom existed, so it is very possibly to do it with fully farmable teams now. The general strategy is to bring a nuke, silence/stun, heal/rez, and cleanse. Cleanse is necessary to remove the Fallen Angel’s debuffs/eternal silence. If you don’t have a self-rez on death (hunchback), it’s good to bring a buffer (statue/jade dragon) to help your cleanser of choice not be silenced for 99 turns. The stun/silence are to help get you through the first two floors, and also to give you more time to charge up your specials. If you would like more box-specific help, ask on discord for a team from your box. Why am I not able to place well in Dungeon Challenge? It takes time to build up your shrines, get the good 4-dots to populate the dungeon, and roll a good team. If you expect to be able to compete in gold Dungeon Challenge after 2 months without playing hours every day or being incredibly lucky, you should play another game. How do I clear Emperor difficulty quests? This team build is borrowed from Evolsir + Uberseed who helped me with my team, since I’m too unoriginal to think of a better build. Wisp/Jade Dragon/Hunchback/Stun/Nuke is the general template team. Occasionally I run double hunchback instead of a stun, or hunch/astral if it’s white Grand Wish. Double dark elf is also a viable option instead of stun. Good luck farming those ankhs! How do I clear Deity level expert quests? Mantastic has found success running a 4/5 farmable team via Hunchback/Wisp/Jade/Astral/Dark Elf. It may be possible to clear with dual Hunchback but may make some floors more challenging since both resurrections are the same colour. Why is this great idea I suggested not implemented yet? It would make the game so much better! Why don’t you work for VCME? Kingdom requires renown to expand and level up. Buildings provide renown, and leveling buildings gives more renown (level 2 renown). The buildings produce ore, wood, sulphur, mercury, gems, and scrolls. The non-production buildings are color and size shrines, which you unlock after leveling your kingdom to 15. Gem mines are generally the least worthwhile to keep active. Even though they are easy to upgrade, the amount of exp gems they produce is probably only worthwhile if you need to slowly accumulate 2000 medium gems of a certain color for castle upgrades. Your kingdom runs on wood and ore. These should be your priority – put your best creatures on these at first. Scrolls are used to research upgrades, so choose wisely what to research first! Sulphur and mercury are not used much in early stages of kingdom, but once you begin leveling shrines and rolling enchants, you will always need more. Putting creatures with more stars, including colored stars, increases the efficiency of the structure, and higher efficiency means higher yield. This means that fully awoken epics are incredibly useful in kingdoms if you don’t yet have enough awakenings on your legendary creatures yet. Make sure you check your kingdom at least once a day, once the building reaches capacity you don’t gain any more resources from that building. Buildings that are not currently in use still provide renown for your kingdom. Every 5 levels, your buildings get a significant boost in production, and every 5 levels, your kingdom merchants increase quantity of goods offered. There are three types of kingdom merchants – one ticket, one token, and one diamond. Generally, ticket merchants give you scrolls, wood, and ore. Token merchants offer three different items, which can be any combination of ore, wood, sulphur, mercury, and scrolls. The diamond merchant offers 2nd/3rd tier materials, quick battle tokens, totems, color and epic essences of the color it is. Your kingdom only produces first tier materials. To farm second and third tier materials required to level certain structures, you must play the appropriate size restricted quest, roll it from token chests, or acquire them from the diamond merchant. To farm the first level wood/ore, I would recommend playing the regular version of these quests/expert quests if you can handle them. You will need lots of gold, tokens, and exp gems to level your castle. At level 20, the land expansions cost 2 million gold each, so be prepared. You will also need something like 2000 medium gems of each color and 400 large of each color later on at some point in the late tens/early twenties of castle level. Level 25 in particular requires 5000 tokens. Token farming is best done on Might over Magic, as you can generally finish the boss battle with 2 battles, making it probably the most time efficient method of token farming. Libraries require a lot of tomes and compendiums, make sure you have plenty of each to upgrade your libraries and enough for rolling enchants later. Shrines require first sigils, then color runestones, then ankhs, then divine runestones/ankhs to level up. I believe the total is around 50 sigils (used for upgrading until level 10), 330 color runestones, and 100 ankhs (20-24). Beyond this, you need lots of divine ankhs and runestones. This was hugely helpful, TY so much for the guide ookiii! I have been digging for info and this is the best I have found so far.